A phrase from primary school keeps coming back to me when I think on how to encourage students past this stage – ‘look with your eyes not your hands’. Equally though, the artist needs to give an impression of the volume of the form, so slavish precision isn’t to be encouraged either. A balance must be stuck between the appearance of the thing and the essence of the thing. Complicating the artist’s job is the fact that people look for information in objects beyond their physical appearance – looking at the sky to check the weather, or at a river to see how deep or fast it is. I think this is part of the mindset that abstract art either has no merit or requires no skill. If people see without looking or look without seeing for the majority of the time, what use do they have for a thing that doesn’t look like it’s supposed to (avoiding the question of the utility and purpose of art)? 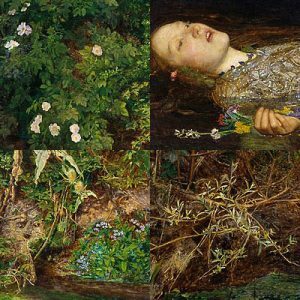 Millais’ Ophelia – detail everywhere! Picking out the most important elements of a thing to make a picture aesthetically appealing often means leaving out the detail required for an object to read correctly. Speed points to the Pre-Raphaelite Brotherhood as an example of an exception to the rule (“in their work the excessive realisation of all details […] gave emphasis to the poetic idea at the basis of their pictures, and was therefore part of the artistic intention […] every detail being selected on account of some symbolic meaning it had”) but, in the main, excessive detail makes it difficult to identify the important elements in the scene and the message of the painting is lost. 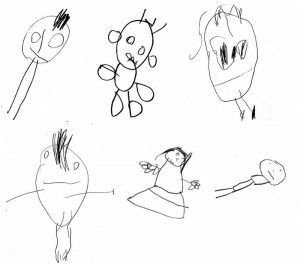 The naive approach to art – outlining masses according to touch – might be part of what gives cartoon drawings their association with childishness in the West. Obviously that’s reinforced by notable examples of badly-written, poorly-drawn books and TV shows designed as extended adverts for plastic tat, but, beyond that, cartoons carry the stigma of ‘not real art’ in cultures with a history of realism. Scott McCloud’s Understanding Comics talks about the phenomenon of characters as icons vs.characters as actors, and the way we identify more readily with characters who are more symbolic representations of a figure (eg: The Moomins, Tin Tin) than with characters who are highly detailed (eg: Marvel or DC characters). I can’t help but wonder: how does this apply to painted figures? Does colour vs monochome affect projection? What about realism in painting vs stylisation?